LADIES! This post may be helpful to those of you representing the “in a relationship” status right now. 1. Ask yourself honestly what your motivation is for changing the way your man dresses — the purer the motivation (i.e. to help him develop confidence), the better the results. 2. If you haven’t discussed his style issues before, now is the time to let him know you’d like to take over in the fashion department. 3. If he balks, stop here and try again in six months. 4. If he’s relieved to have some help, start by assessing his current wardrobe. 5. Pitch everything that doesn’t fit, needs serious mending or is totally out of style. 6. Assess your guy’s current style with him — is he dressing for power, comfort or stylishness? 7. Work with him to decide what image he wants to portray. 8. 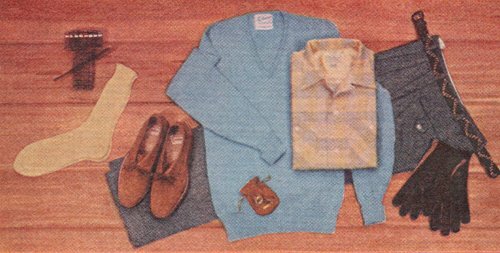 Start slowly redoing his wardrobe, working from the inside out — buy new underwear, undershirts, socks and hankies. 9. Take advantage of the expertise of the salespeople and tailors at the best stores. They’ll help him find the right professional looks that fit. 10. Buy just one new suit that looks terrific, two new shirts and two new ties. 11. Pay attention to details like shoes, belts and socks — they should be good quality and complement the total look..
12. For weekend wear, neatness goes a long way, so just buy replacement shirts, pants, shorts and athletic shoes. 13. Well-worn jeans and Tshirts may have to be pried from his fingers — replace with new jeans and a few new logo Ts. 14. Give casual wear a spin in the washer a few times to break in jeans and shirts — it’ll go far in the comfort department. 1. Study men’s magazines like GQ to get a feel for overall men’s fashion trends. 2. Don’t try to force your style on him — he’s not a doll to be dressed. 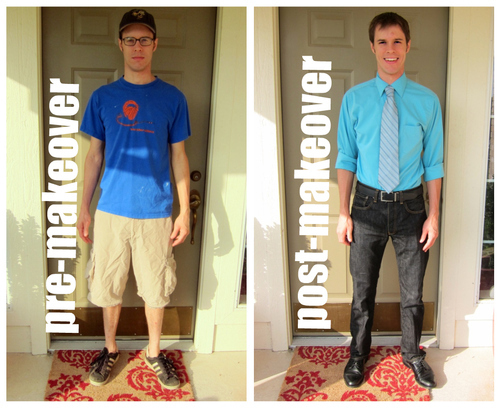 I hope these suggestions and tips work for you because I know I am going to try to makeover my man this weekend!